Be a GFC Fitness Ambassador! Many people take advantage of nice weather by exercising in the great outdoors. Some might skip the treadmill at the gym in favor of running at the park, while others join recreational sports leagues for some exercise and fun in the sun. But exercising outdoors carries its share of risk. Unlike gyms where machinery clearly advises members about proper form and warns against lifting excessive weight, Mother Nature comes with no such warning labels. As a result, it’s up to men and women to make injury prevention a priority when taking their exercise routine outside. The following are a handful of preventative measures that can help exercise enthusiasts avoid injury as they attempt to get or stay fit in the great outdoors. Study the terrain. Part of the danger of exercising outdoors is that, unlike a gym fitted with machines designed for the sole purpose of exercise, nature’s terrain is unpredictable. Safety features you take for granted at the gym, such as padded floors, are nonexistent outdoors. In addition, certain areas in nature might not be suitable to all athletes. 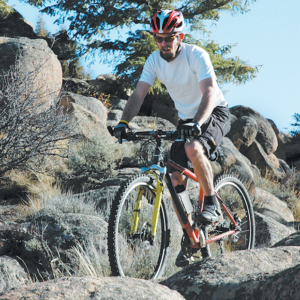 For example, mountain biking is a popular sport, but not all mountain biking trails are the same. Some trails are ideal for beginners, while others are best ridden by more seasoned riders. When your outdoor exercise regimen will be taking you off the beaten path, be sure you know the terrain before you start your workout. Speak with fellow outdoor enthusiasts about which trails or courses are best for someone of your skill level and adhere to their recommendations. When exercising on a trail for the first time, bring a friend along so someone can go get help should an accident happen. Stay hydrated. Dehydration is another cause of injury when athletes exercise in the great outdoors. Gyms have water fountains that allow members to take a drink of water when they’re thirsty. That water can help prevent dehydration, which can be painful and greatly increase your risk of injury. When exercising outdoors, be sure to bring along enough water so you can stay hydrated regardless of how far away from civilization you may find yourself. Honestly assess your abilities. When exercising outdoors, it’s easy to overdo it. Warm air and sunshine have a way of encouraging athletes to prolong their workout routines or push themselves a little harder. But pushing yourself past your limits can considerably increase your risk of injury. While it’s easy to stay within your limits when exercising indoors, where the environment may encourage you to cut a workout short rather than extend it, it’s easy to overextend yourself outdoors when the weather is nice. So it’s important for men and women to make an honest assessment of their abilities before beginning an outdoor exercise regimen. Once you know what your body can and can’t handle, you can tailor your outdoor workout to one that makes the most of nice weather without putting your health at risk. Don’t challenge Mother Nature. One of the biggest risks with regard to exercising outdoors is the tendency some athletes have to ignore the elements. Avoid working out in especially cold or hot weather, as such conditions are not conducive to exercise. Extreme weather also reduces the number of people outside, which means there won’t be as many people around to help you if you suffer an injury, lose your way or need help with your gear. Exercising outdoors is a great way to enjoy nice weather, but limit such workouts to those times of year when temperatures are most conducive to outdoor activity. Working out in the great outdoors is a great way to make the most of a beautiful day. But athletes must still take certain precautionary measures to reduce their risk of injury when exercising outdoors. Superfood: Moringa oleifera plant – What is it? Should you be consuming it? The goal of Get Fit Clovis is to empower people in the Clovis community to strive for a healthy lifestyle. By facilitating meet ups and providing information about the local goings-on in the fitness industry, Get Fit Clovis serves as a support group for those in Clovis and the surrounding communities who desire a healthier lifestyle. We want to inspire people to achieve their personal fitness goals. It’s not about losing weight, although that may be the goal for some, it’s about promoting positive lifestyle change. We believe even the smallest change—whether it is walking 20 minutes on your lunch break or choosing fruit instead of fries—can have a big impact. Get Fit Clovis encourages people of all ages and at all fitness levels to choose a goal and join us! Follow us on social media and come to our Saturday meet ups for support. Together, we can become happier, healthier Clovis citizens!